Narration by PhD Oleg V. Sorokin, the leading developer of "VedaPulse" device and the founder of the Biokvant company. 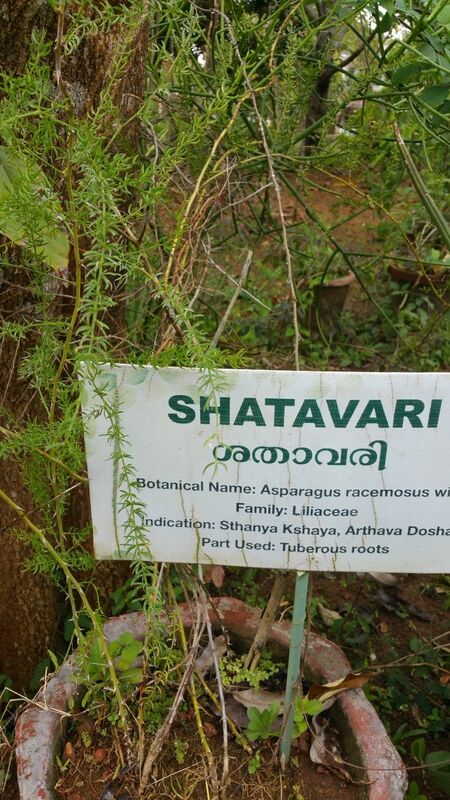 I want to share impressions from my visit to Amrita University (Kerala, India), where I met a scholar and Ayurvedic doctor, who left an etched mark in my soul. The purpose of my visit was to validate some of the VedaPulse algorithms. I first met this person at Mark Rosenberg’s European Congress on Ayurveda in Bernstein, Germany around 2 years ago. He was invited as one of the top speakers. We were introduced to each other "on the run", exchanged business cards and talked for a while; this meeting seemed to end up with nothing. However, the hand of God has already had other plans. It was an emphatically modest man, with a backpack, perfect English, who was giving unusually profound answers to Ayurvedic questions. His name was Dr. Ram Manohar (hereinafter Dr. Ram). In December 2015 I was engaged in preparation of Ayurvedic section at the Congress on traditional medicine of the BRICS countries held in Moscow. There was a question about the invitation of the official delegation from India. As Executive Director of the National Ayurvedic Medical Association (www.namaveda.org), I contacted some representatives of the Ministry of AYUSH (India) directly to organize their public report on the experience of Ayurveda implementation in healthcare systems of different countries. We wanted to invite not only reputable officials, but scientists and researchers with international recognition as well. My good friend Dr. Antonio Morandi (Chairman & Director - School of Ayurvedic Medicine "AyurvedicPoint "; President, SSIMA - Italian Scientific Society for Ayurvedic Medicine; Co-Head of Scientific Board INDRA - International Network for Development of Research in Ayurveda) advised to invite Dr. Ram as one of the most respected scientists and doctors in India, whose works are cited in international scientific journals. So, we met with Dr. Ram for the second time, but in the context of professional activity. It was the Congress that brought us together again, this time to plan validation studies in Dr. Ram’s university. We arrived at the airport of Cochin (capital of Kerala state, India) about noon, after a sleepless night and triple flight from Novosibirsk through Moscow and Delhi, a little tired but full of energy and enthusiasm. At the airport, we were welcomed by Dr. Ram and his driver. Dr. Ram said: "The first thing you should see is the largest monument to Sushruta in the world". 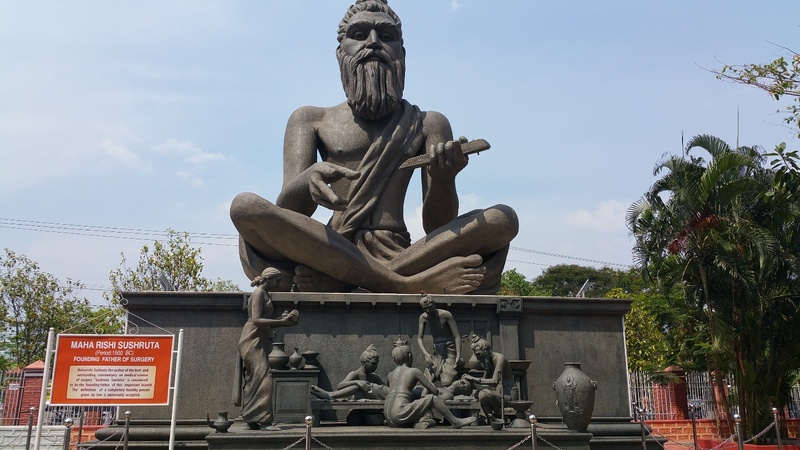 Monumental exposition of Sushruta with his disciples is located in front of a large allopathic hospital, where employees of Amrita University work. 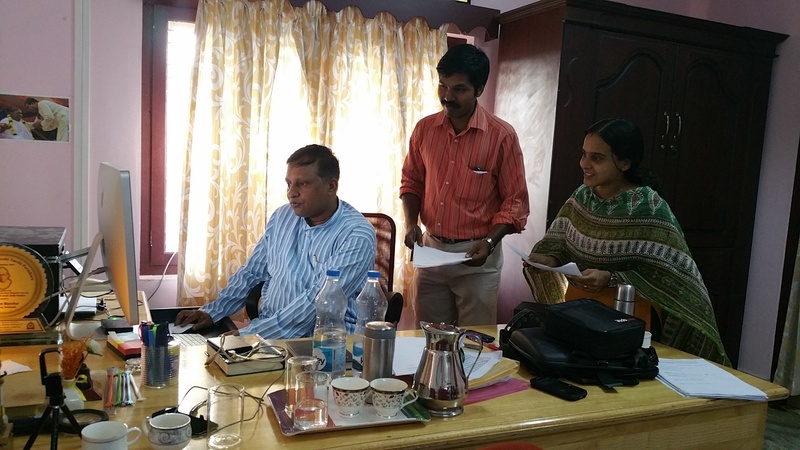 On the way Dr. Ram enthusiastically described his new job at the University (Head of the Research Department (MD (Ay); Research Director, Amrita School of Ayurveda, Kollam; Director and CSO, AVP Research Foundation, Coimbatore, Tamil Nadu, India). He was proposed by the rector of the University about six months ago. I will tell a few words about the rector below, because she is a mystical person. We arrived at one of the campuses of Amrita University – the largest non-governmental University in India – Amrita Center for Nano Science. 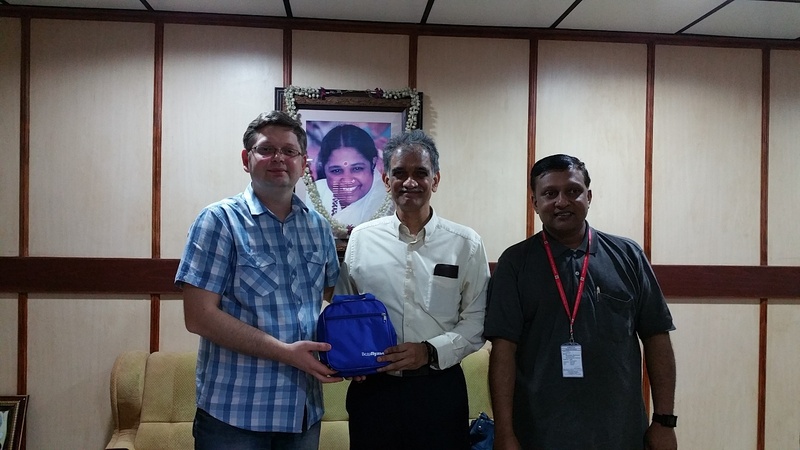 Our first meeting was with the Head of the Center – Dr. Shantikumar Nair. He had been working in the leading scientific centers of the United States for a long time, and then returned to India, after the invitation of the rector of the University as well, to introduce modern methods of laboratory diagnostics and nanotechnology to the educational process. We had a long discussion about the difficulties that Ayurveda faced on the way of legal recognition in various countries, including Russia. 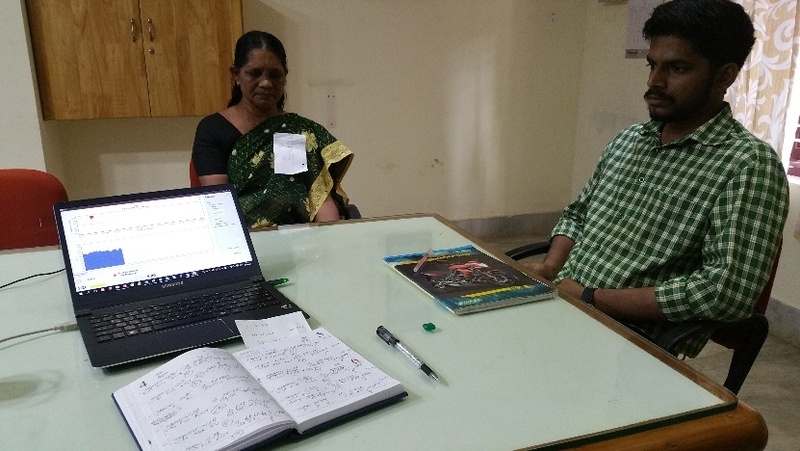 He also wanted to know how I, a Western scholar and physician, managed to create a way to assess important diagnostic criteria on the basis of academic technology that Ayurvedic doctors use. We discussed the possibility of creating an expert group to develop common educational standards for practitioners studying Ayurveda in Russia. 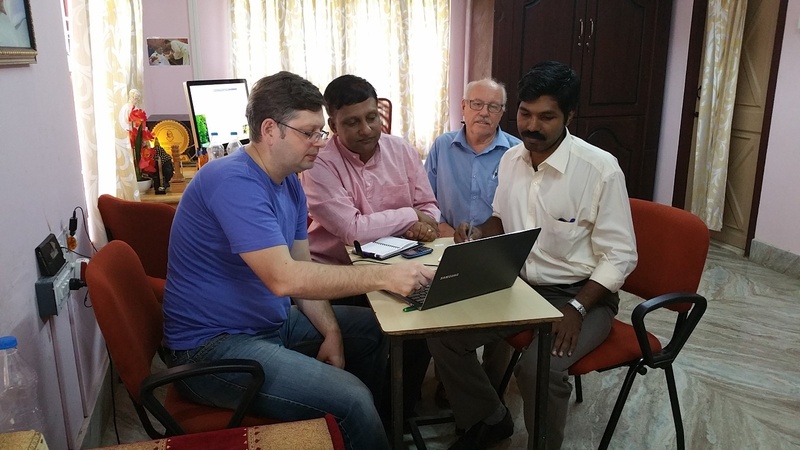 On the photo from left to right: Oleg Sorokin, Dr. Shantikumar Nair (Dean of Research), Dr. Ram Manohar (Research Director, Amrita School of Ayurveda). Dr. Ram has planned a rather "rough" design of the research from the position of provable medicine. It was a blind, randomized study. We say “blind”, because none of the team members had full information about the patients. Randomization assumes that the study includes hospital patients aged 25-65 years with different somatic pathologies of moderate severity. 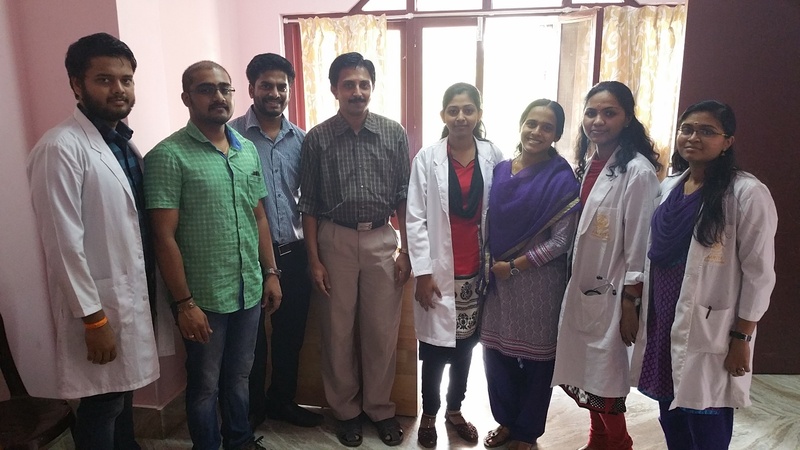 The first day of our research started at the Ayurvedic hospital, located in Ayurvedic College, Amrita University. 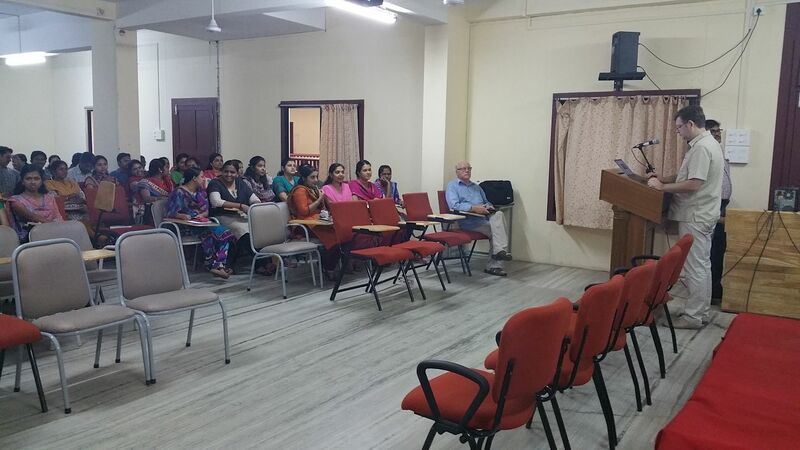 Working expert group consisted of Dr. Ram (the Head of Research, who was controlling all the processes – he personally conducted clinical interviewing and examination of patients (Vikṛtadoṣavaiṣamya — pathological imbalance of Doṣas) with the following palpatory diagnosis of the pulse (Nadi Vijnanam). His colleague Dr. James was doing independent assessments of the pulse, team of PhD-students (interns) were working with patients at completing questionnaires and your humble narrator, Oleg Sorokin, were personally doing recordings of the CIG signal with the VedaPulse device. There was an “invisible” support team working near us, who was making sure that everything was according to plan. None of us knew each other’s results and in the evening Dr. Ram requested information from each of us and made a comparative result compilation. Having assessed about 20 patients within the first day of the study, with a feeling of fulfilment, we went to see the manufacturing facility, where Ayurvedic medicines are being prepared for patients of the hospital according to traditional technology (without tablets and capsules, only churnas, bati and other classical forms). I was genuinely surprised by the fact that there is a unique formula of herbs for each patient according to the recipe of the attending physician. No recipe looks the same as the others. That’s one highly individual therapy! In this regard, it reminded me of the Herbal Therapy extension in VedaPulse, which ranks medicinal plants with regard to the constitution and functional state of a patient, according to which individual herbal prescription is formed. 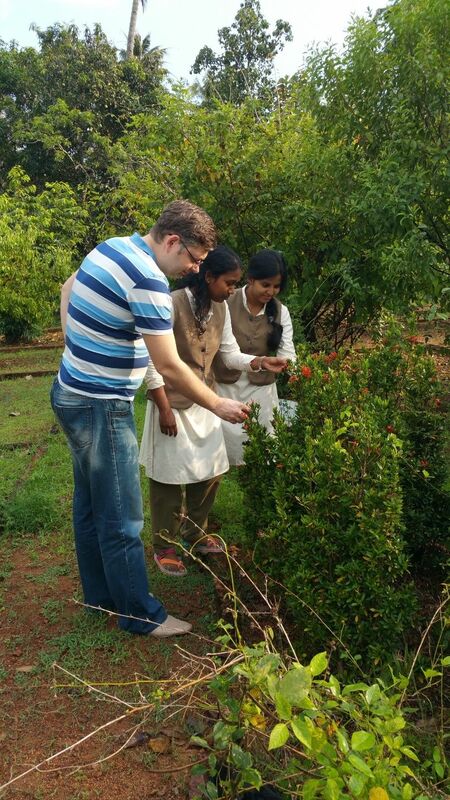 We walked through the garden of medicinal plants, met a lot of students with books, studying Dravyaguna with their own eyes (Ayurvedic Pharmacopoeia). The second day started with an introduction to the Medical Director of the Dr. Br. Sankara Chaitanya (MD, Ay). We signed an official agreement on scientific cooperation between my company Biokvant (through which VedaPulse is manufactured and distributed) and Amrita School of Ayurveda. Realizing that this is only the beginning of our joint journey, we agreed on a strategic partnership in the field of scientific research in Ayurveda. On the photo from left to right: Oleg Sorokin and Dr. Br. Sankara Chaitanya, Medical Director, Amrita School of Ayurveda. 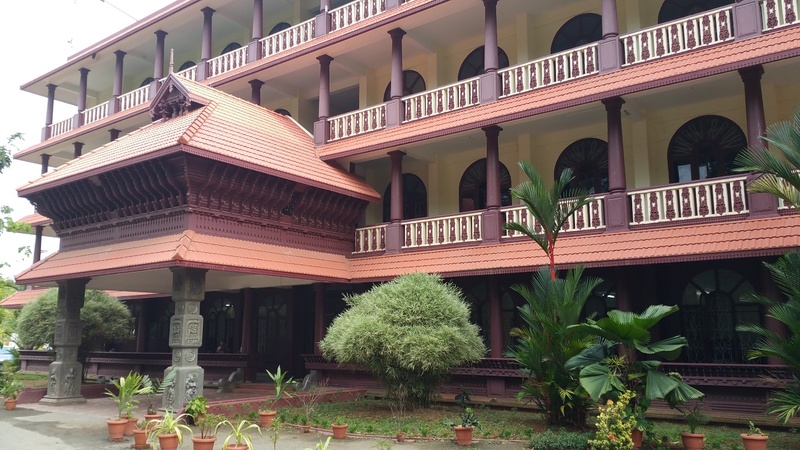 On the third day I met the University rector and spiritual leader, ascetic of Kerala – Amma. I shared my impressions after this meeting on Facebook and would like to add that we received the blessing for our research, development of the pulse analysis technologies and joint educational projects. I think that that this meeting was predefined for me in a Karmic way. It will be a powerful catalyst for the development of my lifework – a scientific cognition of traditional medicine and Ayurveda. Those days we had numerous meetings with researchers of the University and teachers of the College, who spoke highly of our development and sincerely wished us success. 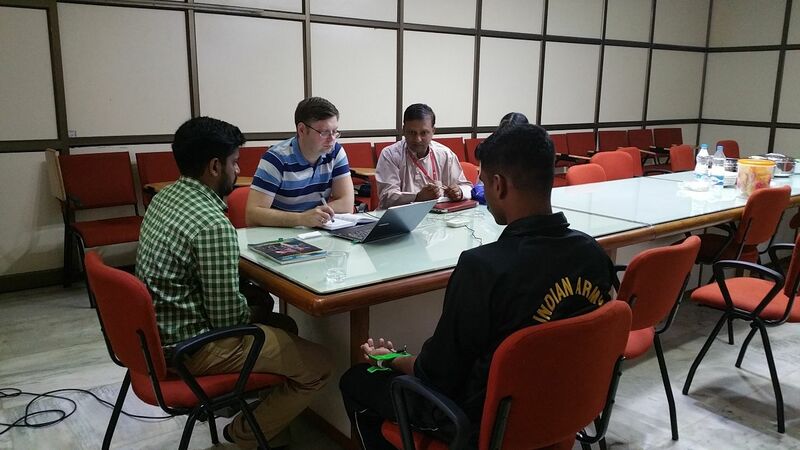 We also met representatives of other foreign delegations, who were conducting their research at the site of Amrita University. On the fourth day me, Dr. Ram and his team were summarizing the first preliminary results until late in the evening and found them to be very encouraging. We needed to approach this question scientifically by applying the methods of the Queen of science – mathematics and impartial statistics. In two weeks we plan to publish the results in one of the oldest cited journals on Ayurveda, which will introduce our study to the scientific and clinical community. Looking ahead I can say that the results of validation exceeded the results obtained in the study, which was conducted with Dr. Vasant Lad in 2014. This section of the article will be extended later, after the release of the publication. The results of this work will be presented from 16th to 19th September, 2016 at the III International Congress in Milan (Italy), where the Russian delegation consisting of members of National Ayurvedic Medical Association and specialists using VedaPulse is heading. Before leaving to the airport, we took photos with Dr. Ram in front of the image of Dhanvantari, and I asked Dr. Ram to give me the guidance on in-depth studying of Ayurvedic medicine. 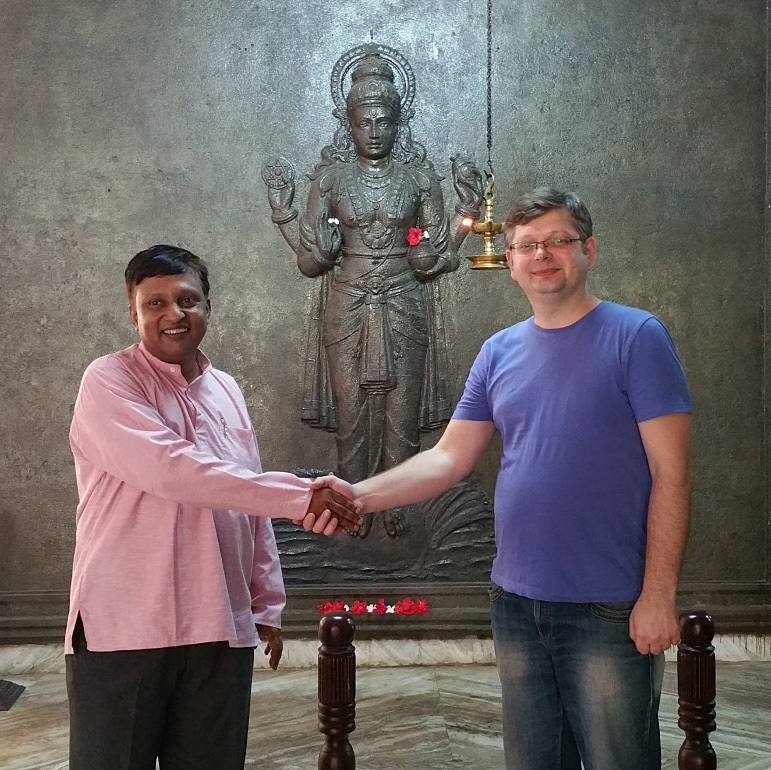 He agreed to take on a challenging mission to become a scientific advisor of NAMA and help us developing educational projects on Ayurveda in Russia.